Media captionJohn Kerry: "If this arrangement holds then we will see a significant reduction in violence across Syria"
Russia and the US have agreed to co-ordinate air strikes against Islamist militants in Syria, part of a detailed agreement to reduce the violence there. The plan will begin with a "cessation of hostilities" from sunset on Monday. Syrian forces will end combat missions in specified opposition-held areas. Russia and the US will then establish a joint centre to combat jihadist groups, including so-called Islamic State (IS). A Syrian opposition coalition has cautiously welcomed the agreement. "We hope this will be the beginning of the end of the civilians' ordeal," said Bassma Kodmani, a spokeswoman for the High Negotiations Committee. "We welcome the deal if it is going to be enforced." Turkey welcomed the plan, and said aid needed to reach those in need "from the first day"
British Foreign Secretary Boris Johnson urged Russia to "use all its influence" to ensure the Syrian government "delivers on its obligations"
The announcement follows talks in Geneva between US Secretary of State John Kerry and his Russian counterpart, Sergei Lavrov. The plan would need both the Assad government and opposition "to meet their obligations", Mr Kerry said. The opposition had indicated it was prepared to comply with the plan, he said, provided the Syrian government "shows it is serious". Mr Lavrov said Russia had informed the Syrian government about the arrangements and the Syrian government was "ready to fulfil them". Ten more years of war? Mr Kerry said the cessation of hostilities also involved humanitarian access to besieged areas, including Aleppo. Seven days after the start of the cessation of hostilities, Russia and the US will establish a "joint implementation centre" to fight IS and another main group, Jabhat Fateh al-Sham. Jabhat Fateh al-Sham used to be known as the Nusra Front but changed its name in June and announced it was cutting ties with al-Qaeda. Mr Lavrov said the joint implementation centre would allow Russian and US forces to "separate the terrorists from the moderate opposition". "We have agreed on the areas where such co-ordinated strikes would be taking place, and in those areas, on neutral agreement shared by the Syrian government as well, only the Russian and US air force will be functional," he said. But Mr Lavrov added that "the Syrian air force will be functional in other areas, outside those that we have singled out for Russian-American military co-operation". Getting a deal was an achievement, given the sour atmosphere between Moscow and Washington. It offers some fragile hope about stopping the slaughter. But there is scepticism about its chances. That is because a lot is going to have to go right, quite quickly, if the agreement is to work. One necessity is President Assad's consent. A week-long ceasefire might be possible, but a political deal to end the war is still out of sight. The Assad regime's survival depends on the Russians, so he will listen to them. But with Russia's help, the Assad regime is looking more robust. So it is hard to see why the president, or his Russian allies, would want him to go. The war in Syria is made up of layers of conflict, which connect up to regional and global rivalries. That makes it very hard to calm, let alone end. Mr Lavrov and Mr Kerry stressed that the plan could pave the way for a political transition. "The plan is more prescriptive and far-reaching than any proposal to date and, if implemented by all sides, could allow political negotiations to take place on Syria's future," Mr Kerry said. The United Nations envoy to Syria, Staffan de Mistura, welcomed the agreement and said the UN would exert all efforts to deliver humanitarian aid. 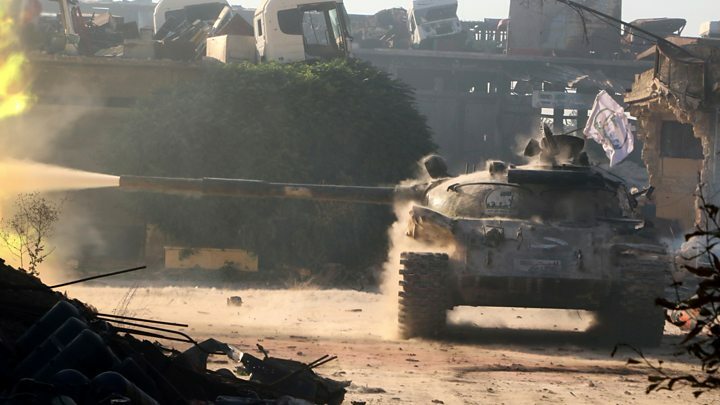 Fighting has recently escalated between Syria's army and rebels in eastern Aleppo, where 250,000 people live. On Sunday, Syrian government forces were reported to have recaptured parts of Aleppo which were lost to rebels last month, placing rebel-held districts in the city's east once again under siege. Mr de Mistura warned earlier on Friday that food and water shortages made the situation in Aleppo even more serious, and that fuel supplies could run out within days. UN humanitarian chief Stephen O'Brien told the BBC conditions in Aleppo had become appalling: "Eastern Aleppo is at the apex of horror, where any one of us, if we were there, would find life barely possible, let alone tolerable." The US and Russia support opposite sides in the conflict that began in 2011: Washington backs a coalition of rebel groups it describes as moderate, while Moscow is seen as a key ally of President Assad.